This blog deals almost exclusively with my Python coding activities. Then, simply pointing the browser at "http://localhost:8000" and all is set to go. Granted, it is not what one might consider a traditional "one-liner" but it works for me. Python's batteries included is certainly a nice feature! In the last blog post, I made use of cython to speed up some calculations involving the iterative equation defining the Mandelbrot set. From the initial profiling run with 1000 iterations in the second post to the last run in the previous post, the profiling time went from 575 seconds down to 21 seconds, which is a reduction by a factor of 27. This is nothing to sneer at. Yet, I can do better. Let's start by having a sample profile run with 1000 iterations with the program as it was last time, but keeping track of more function calls in the profile. I notice that there are many function calls: over 5 millions of them. While most of them appear to take very little time, they do add up in the end. It is time to adopt a smarter drawing strategy. Currently, a "line" is potentially drawn for each pixel. If I look at a given fractal drawing, I can see that it could be drawn using "longer lines", when consecutive pixels are to be drawn with the same colour. I can easily implement this as follows. And it is now again my own code in create_fractal() that appears to be the limiting factor. Thinking back of when I increased the number of iterations from 100 to 1000, thus only affecting the execution time of mandel(), it seemed like this might be a good place to look at for possible time improvements. Let's recall what the code looks like. cdef double z_real = 0., z_imag = 0. Alas, that is not the case, as the previous profiling run was slightly below 4 seconds. [Note that I did run each profiling test at least three times to prevent any anomalous result.] Apparently my intuition is not a very good guide when it comes to predicting how cython will be able to optimize a given function. We will modify mandel() so that it returns the number of iterations required to evaluate that a given point does not belong to the set; if it does belong, we will return -1. We will create a colour palette as a Python list. For a given number of iterations required by mandel(), we will pick a given colour, cycling through the colours from the palette. We will need to change our line drawing method so that we keep track of the colour (number of iteration) rather than simply whether or not the point is in the set ("black") or not. The code is a bit trickier to set up than the previous version, but it uses a similar logic. To determine what colour to draw, we first calculate the colour of the first pixel, and then loop through all the others along a same line. Each time we see a colour change, it signals that we need to draw a line up to that point in the colour used up to that point ("current_colour") and assign the new colour as the new "current" one. When we reach the end of a line (column in the code...), we need to ensure that we draw the last line segment. Without further ado, here is the complete code of the revised cython module. We also generate some nice pictures! First, using only 100 iterations. 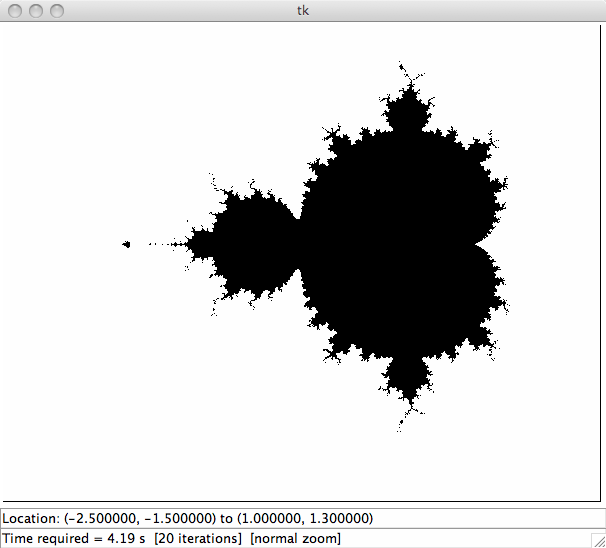 Notice how the Mandelbrot set boundary seems rather smooth ... this is clearly a sign that we might be missing something. Increasing the number of iterations to 1000 reveals a different picture. We see much more details and many points that were wrongly identified as being part of the Mandelbrot sets are correctly excluded (and colored!). What happens if we look at a region that contains more points inside the Mandelbrot set (thus requiring more iterations) and increase the number of iterations to 1500 (as I found that 1000 was not enough in this region). Unfortunately, the profiling and the timing information displayed does not tell the entire story. In practice, I found that it would take many more seconds (sometimes more than 10) for the canvas to be updated than the timing information given for each of the three pictures displayed above. Something is happening behind the scene when the picture is updated on the screen and which is not being recorded by my simple timing method. For comparison, I had a look at Aptus, a program that uses a hand-coded C extension for speed. Actually, I had tried Aptus a few years ago, when Ned Batchelder first mentioned it, and tried it again for fun as I was working on my own version. Aptus can produce really nice pictures, really fast. Here's an example that was produced, according to the timing given by Aptus itself in 0.25 seconds. Note that the timing given by Aptus seems to be truly representative, unlike the timing for my program. I should mention that, in addition to using a hand-crafted C extension, Aptus uses wxPython instead of Tkinter, and it also uses PIL and numpy, both of which are known for their speed. It might be possible that using PIL and numpy with my program would improve the speed significantly. However, all three libraries are not part of the standard library and so do not meet the constraints I had decided upon at the beginning. This concludes this profiling experiment ... at least for now. I should emphasize that the goal of these posts was to record a profiling experiment using cython. I do not pretend that this code was especially hand-crafted for speed ... even though I did try some simple changes to improve its speed. I may revisit this application at a later time, especially if someone more experienced can point out ways to increase the speed significantly, preferably while staying within the constraints I set up at the beginning: other than cython, use only modules from the standard library. However, I would be interested if anyone adapts this code to use PIL and/or numpy in a straightforward way and, in doing so, increases the speed significantly. In the previous blog post, I made some attempts at speeding up the function mandel() by making changes in the Python code. While I had some success in doing so, it was clearly not enough for my purpose. As a result, I will now try to use cython. Before I do this, I note again the result from the last profiling run, limiting the information to the 5 longest-running functions or methods. The goal of cython could be described as providing an easy way to convert a Python module into a C extension. This is what I will do. [There are other ways to work with cython extensions than what I use here; for more information, please consult the cython web site.] Note that I am NOT a cython expert; this is only the first project for which I use cython. While I am not interested in creating an application for distribution, and hence do not use the setup method for cython, it is quite possible that there are better ways to use cython than what I explore here. I first start by taking my existing module and copying it into a new file, with a ".pyx" extension instead of the traditional ".py". Note that I have removed the equivalence between range and xrange. The reason I have done this is because with xrange present like this in the file results in a compilation error when running cython with Python 3.1. Furthermore, as will be seen later, it is not really needed even for Python 2.x when using cython properly. I have also included a commented line stating that 'profile' was equal to True; this is a cython directive that will enable the Python profiler to also include cython functions in its tally. In order to import this module, I also need to modify the viewer to import the cython module. Here is the new version. Other than the top few lines, nothing has changed. Time to run the profiler with this new version. A reduction from 85 to 50 seconds; cython must be doing something right! Note that the calls to abs() have been eliminated by using cython. All I did is import the module via Python without making any other change to the code. Note also that mandel appears twice: once (the longest running) as the function defined on line 8 of mandel2_cy.pyx, and once as a object belonging to the module mandel2_cy. I will come back to this later but, for now, I will do some changes to help cython do even better. As mentioned before, cython is a tool to help create C extensions. One of the differences between C and Python is that variables have a declared type in C. If one tells cython about what type a given variable is, cython can often use that information to make the code run faster. As an example, I know that two of the variables are of type integers which is a native C type; I can add this information as follows. Another significant time reduction, this time of the order of 20%. And we didn't tell cython that "z" and "c" are complex yet. I can change the code so that I deal only with real numbers, by working myself how to multiply and add complex numbers. I can use some special cython technique to extract all the relevant information about the Python built-in complex data type without changing the code inside the function (other than adding some type declaration). The time difference between this run and the previous one is within the variation I observe from one profiling run to the next (using exactly the same program). Therefore, I conclude that this latest attempt didn't speed up the code. It is possible that I have overlooked something to ensure that cython could make use of the information about the complex datatype more efficiently ... It seems like I need a different strategy. I will resort to doing the complex algebra myself, and work only with real numbers. Here's the modified code for the mandel module. This total execution time has been reduced from 38 to 7 seconds. 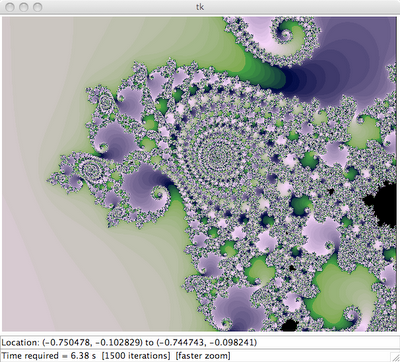 mandel() is no longer the largest contributor to the overall execution time; draw_fractal() is. However, the program is still a bit too slow: without actually doing any drawing, it takes approximately 0.6 seconds to generate one fractal image. However, I can do better. Looking at the code, I notice that draw_fractal() contains two embedded for loops, resulting to all those calls to mandel(). Remember how telling cython about integer types used in loops sped up the code? This suggest that perhaps I should do something similar and move some of the code of draw_fractal() to the cython module. Here's a modified viewer module. And here is the new cython module, without any additional type declaration. Simply by moving over some of the code to the cython module, I have reduced the profiling time to almost half of it previous value. Looking more closely at the profiling results, I also notice that calls to mandel() now only appear once; some overhead in calling cython functions from python modules has disappeared. Let's see what happens if I now add some type information. However, one thing I remember from the little I know about C it that, not only do variables have to be declared to be of a certain type, but the same has to be done to functions as well. Here, mandel() has not been declared to be of a specific type, so cython assumes it to be a generic Python object. After reading the cython documentation, and noticing that mandel() is only called from within the cython module, I conclude that not only should I specify the type for mandel() but that it probably makes sense to specify that it can be "inlined"; I also do the same for draw_pixel(). This yields a nice improvement. However... I asked cython to "inline" mandel, thus treating them as a pure C function. Yet, they both appear in the Python profiling information, which was not the case for abs() once I used cython for the first time. The reason it appears is that cython has been instructed to profile all functions in the module, via the directive at the top. I can selectively turn off the profiling for an individual function by importing the "cython module" and using a special purpose decorator as follows. The result is even better than I would have expected! However, increasing the number of iterations to 1000 (from the current value of 100 used for testing) does increase the time significantly. It is probably a good time to put back the drawing to see what the overall time profile looks like in a more realistic situation. Clearly, the limiting time factor is now the Tkinter based drawing, and not the other code. It is time to think of a better drawing strategy. However, this will have to wait until next post. 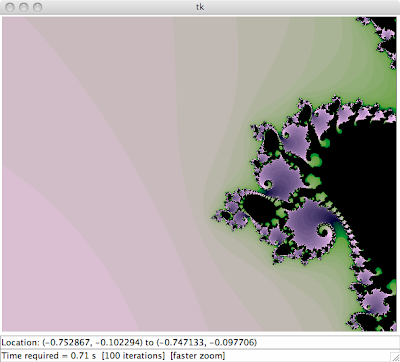 In the previous blog post, I introduced a simple Tkinter-based viewer for the Mandelbrot set. As I mentioned at that time, the viewer was really too slow to be usable. In this post, I will start do some basic profiling and start looking for some strategies designed to make it faster. The first rule for making an application faster is to do a proper profile rather than guessing. I make use of the profiler module, focusing on the main method (draw_fractal()) which I wish to make faster, and paying a closer look only at the most time-consuming functions/methods. Clearly, running the profiler adds some overhead. I should also add that there are variations from run to run done with the profiler, caused by background activities. As a consequence, I normally run the profiler 3 times and focus on the fastest of the three runs; however I will not bother to do this here: I simply want to start by establishing some rough baseline to identify the main contributors to the relative lack of speed of this program. It appears clear that the largest contributor to the overall execution time is mandel(). Going down the lists of functions that contribute significantly to the overall time, I notice quite a few calls to Tkinter function/methods. So as to reduce the time to take a given profile, and to focus on mandel(), I will temporarily eliminate some Tkinter calls by changing draw_pixel() as follows. Ouch! Close to 10 minutes of running time. However, it is clear that I have accomplished my goal of reducing the importance of Tkinter calls so that I can focus on my own code. Let's repeat this profiling test using Python 3.1. Since a fair bit of time is spent inside abs(), perhIaps could speed things up by using another method. 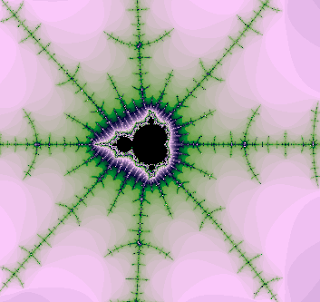 The way that we approximate the Mandlebrot set is by iterating over a number of time and checking if the absolute value of the complex number is greater than 2; if it is, then it can be proven that subsequent iterations will yield larger and larger values which means that the number we are considering is not in the Mandelbrot set. Since taking an absolute value of a complex number involves taking a square root, perhaps we can speed things up by not taking the square root. Let's implement this and try it out. Clearly, I need a different strategy if we are to reduce significantly the execution time. It is time to introduce cython. However, this will have to wait until the next blog post! until the third post in this series. attempting to write a C extension (which I found too daunting since I don't know C), I decided to try to use cython. as easy as Python itself. After looking at a few examples on the web, I concluded that such a rather bold statement might very well be true and that it was worthwhile trying it out on a more complex example. Furthermore, I thought it might be of interest to record what I've done in a series of blog posts, as a more detailed example than what I had found so far on the web. As I was wondering if an esoteric problem like the four-colouring grid challenge mentioned previously was a good candidate to use as an example, by sheer serendipity, I came accross a link on reddit by a new programmer about his simple Mandelbrot viewer. standard library. This means using Tkinter for the GUI. The program should work using Python 2.5+ (including Python 3). So, without further ado, and based on the example found on the reddit link I mentioned, here's a very basic fractal viewer that can be used as a starting point. I have tried to write the code in the most straightforward and pythonic way, with no thought given to making calculations fast. It should be remembered that this is just a starting point: first we make it work, then, if needed, we make it fast. The function mandel() is the simplest translation of the Mandelbrot fractal iteration into Python code that I could come up with. The fact that Python has a built-in complex type makes it very easy to implement the standard Mandelbrot set algorithm. I have taken the maximum number of iterations inside mandel() to be 20, the same value used in the post I mentioned before. According to the very simple method used to time the application, it takes about 2 seconds on my computer to draw a simple picture. This is annoying slow. Furthermore, by looking at the resulting picture, and trying out with different number of iterations in mandel(), it is clear that 20 iterations is not sufficient to adaquately represent the Mandelbrot set; this is especially noticeable when exploring smaller regions of the complex plane. A more realistic value might be to take 100 if not 1000 iterations which takes too long to be practical. Tkinter's canvas does not have a method to set the colour of individual pixels. We can simulate such a method by drawing a line (for which there is a primitive method) of length 1. The screen vertical coordinates ("y") increase in values from the top towards the bottom, in opposite direction to the usual vertical coordinates in the complex plane. While the picture produced is vertically symmetric about the x-axis, I nonetheless wrote the code so that the inversion of direction was properly handled. # and forth between two possible zooming mode. # over the zooming scale. # to look at various regions of interest in the complex plane. # I will implement this using mouse controls. # complex plane currently displayed. of the speed of the application. Finally, since I expect that both the function mandel() and the drawing method draw_fractal to be the speed-limiting factors, I will leave them out of the fractal viewer and work on them separately. If it turns out that the profiling information obtained indicates otherwise, I will revisit this hypothesis. 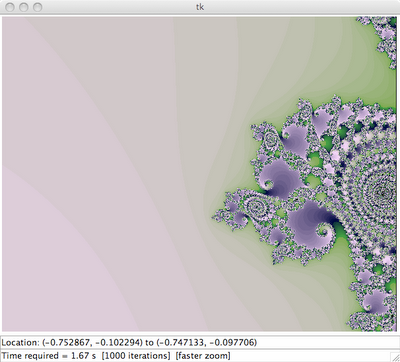 Here is a second prototype for my fractal viewer, having the features described above. # We change the size of the image using the keyboard. # We move the canvas using the mouse. 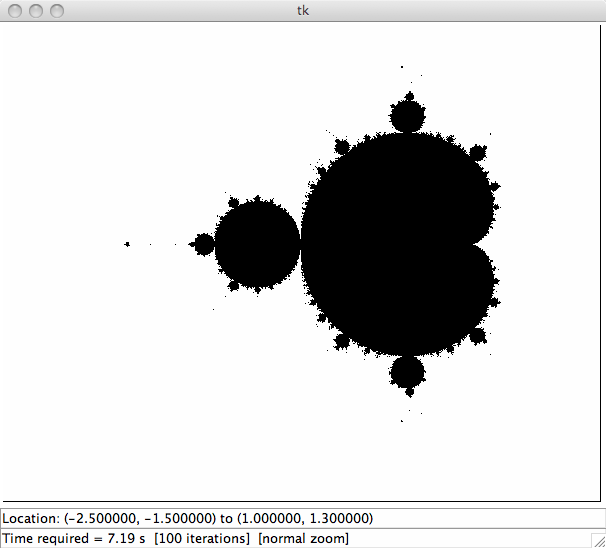 I move the Mandelbrot set calculation in a separate file. And, finally, I implement the missing functions for the viewer in a new main application. Let me conclude with few black and white pictures obtained using this program, which, if you look at the time, highlight the need for something faster. First for 20 iterations, drawn in 4 seconds. Next post, I'll start profiling the application and make it faster. Python + cython: faster than C? I've been playing around with cython and will write more about it soon. But I could not resist doing a quick test when I read this post, comparing C and Java on some toy micro benchmark. I know, I declared fib() to be of type "double" in the C code (like what was done in the original post) and "int" in the cython code; however, if I declare it to be of type "int" in the C code, I get -0 as the answer instead of 433494437. I could declare it to be of type "unsigned int" ... but even when I did that, the Python code was marginally faster. What is most impressive is that the cython code is NOT pre-compiled, unlike the C code. However, to be fair ... I did run it a few times and took the best result, and it was always slower the first time. More seriously: using cython is a relatively painless way to significantly increase the speed of Python applications ... without having to learn a totally different language. Thanks to some wonderful work by some developers who joined the project, rur-ple is moving forward again. :-) Its new home also features a brand new logo for it displayed above. Thanks in particular go to Frederic Muller who is moving things along rather nicely.